Shortly after the National Health Service was established in 1948, a new breed of doctor emerged who was clinically competent but sought to go further by undertaking research into the cause of disease, usually in collaboration with scientists. Michael Oliver, who has died aged 89, was in the vanguard of this movement, and with his biochemist colleague in Edinburgh, George Boyd, he demonstrated a relationship between cholesterol and coronary artery disease. A tall, elegant figure, immaculate in his white coat, MFO, as he was known, would occasionally visit his wards and then rush, with arms and legs flailing, down the long medical corridor to the department of cardiology in the Royal Infirmary of Edinburgh, followed by his breathless entourage. He was envied, as were his few like-minded colleagues, by the more prosaic clinicians on the staff who felt that academic colleagues like him did not contribute sufficiently at the coalface. But the international standing of that hospital unquestionably depended upon these clinical scientists. Michael was born in Borth, near Aberystwyth, the only child of Wilfred and Cecilia Oliver (nee Daniel). His father was a professional soldier who served with distinction in the first world war, being mentioned in dispatches and winning the Military Cross. He was also an outstanding golfer. When Michael was 15 and at Marlborough college, Wiltshire, his father shot himself after many years of despair, depression and drinking, as a consequence of not finding a role after his life in the army. His mother went on to marry the local general practitioner, Hugh Leishman, who persuaded Michael to study medicine in Edinburgh, where he graduated in 1947. He was inspired by Rae Gilchrist, the senior cardiologist in the Royal Infirmary, to enter that speciality. With a constant supply of research fellows he published some 350 papers, the last of these in March. The most important related to the role of free fatty acids and their potential in precipitating cardiac arrest in patients with myocardial infarction; the primary prevention of ischaemic heart disease by reducing blood cholesterol with clofibrate (sold as Atromid-S); and, led by Desmond Julian, the design and creation of a dedicated coronary care unit, as found today in every general hospital. 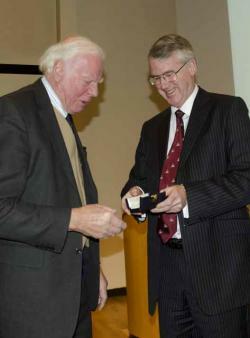 The Edinburgh unit was the first such in Europe, and Michael Oliver founded the department of cardiovascular medicine at the University of Edinburgh. These major contributions led to frequent invitations to lecture at home and abroad. He was Duke of Edinburgh professor of cardiology (1979-89), president of the British Cardiac Society (1980-84), president of the Royal College of Physicians of Edinburgh (1985-88), and was awarded numerous honorary fellowships from sister medical royal colleges. But what delighted him most were honorary degrees from the Karolinska Institute of the University of Stockholm and the University of Bologna. He was appointed CBE in 1985 for services to medicine. Michael suffered to some extent from being a prophet in his own land and there is no doubt that he was held in greater esteem beyond Edinburgh, where his avowed elitist views did not always strike a chord with his more egalitarian Scottish colleagues. Nonetheless, in 2012 he was awarded the Cullen prize for a fellow of the Edinburgh college whose contribution has been of the greatest benefit to the practice of medicine. Michael challenged dogma and perceived wisdom, and encouraged his trainees to do the same. His originality of thought was a asset and a key feature of Michael’s academic contributions. He continued to publish insights and commentaries throughout his life. It is typical of Michael that just a year before his death that he challenged younger – and older – doctors, though the College journal, to “ponder more”! On retirement from the university in 1989, he moved to London, and also had a home in Umbria. He had an expert knowledge of Renaissance art. He is survived by his children Mark, Sarah and Paul, and five grandchildren.